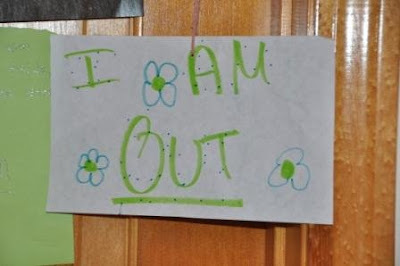 Daughter has recently taken to decorating the doors of the bedrooms in our house. Not with your normal run-of-the-mill door decor, mind you. Being of a pragmatic nature, she has made everyone mail pouches, nametags, and "In" and "Out" signs. Like she is somehow channeling Lucy of the Peanuts. "To make an appointment, write your name the date and time in the correct boxes (below). Once it is time for your appointment, please knock softly and I will check you off and I will let you in. I only make exceptions of mom (sometimes dad), pets, and urgent needs. I will be happy to help even if it's just a visit. Thank you." Her brothers follow these instructions diligently, but I usually ignore them and just enter her room at will. 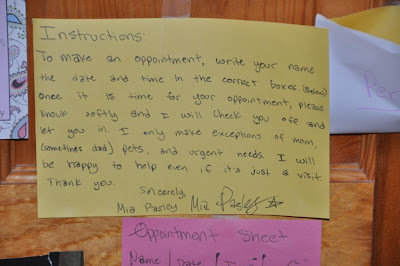 So up until a couple of days ago, there was another note on her door saying that even parents need to make appointments -- "and that means you Patty Pasley." She apparently has given up on me because that note disappeared today. This all makes me wonder about her destiny. What in the world will she be? Something that requires instruction and attention to detail, it seems. All I know at this very moment is that it's a good thing for our pets that they don't have to check in. The "correct boxes" would be hard for the cat to reach.